The majority of public transit rolling stock that Canadians depend upon to get them to where they are going were reported to be in good to very good condition in 2016. Buses were the most common type of rolling stock asset owned by government organizations, followed by railcars and specialized transit vehicles for people with disabilities. Statistics Canada, in partnership with Infrastructure Canada, has launched its first-ever catalogue of the state of the nation's infrastructure. The catalogue provides statistical information on the stock, condition, performance and management strategies of Canada's core public infrastructure assets. This includes a wide variety of assets owned and operated by provincial, territorial, regional and municipal governments, from bridges and tunnels, roads, wastewater, stormwater, potable water and solid waste assets, to social and affordable housing, culture, recreation and sports facilities, and public transit. The Daily is running a series of releases to present this new information, each addressing a sub-group of assets. This fifth installment in the series presents findings on public transit assets; a final release on the topic of asset management is planned for the coming weeks. In 2016, 315 government organizations across Canada owned public transit assets; most of these were municipal governments (292). Their rolling stock public transit assets consisted of 17,852 buses of various types, 3,479 railcars, 1,281 specialized transit vehicles, 247 streetcars and 12 ferries. Fixed public transit assets included 28,140 transit shelters, 13,937 bicycle racks and shelters, 740 passenger stations and terminals, 375 maintenance and storage facilities, 334 park and ride parking lots, 255 passenger drop-off facilities, and 207 exclusive rights-of-ways. There were also 7,103 single-track kilometres of roads and 1,573 single-track kilometres of rail, comprising the public transit road and track network. Government organizations across Canada owned 17,852 buses of various types in 2016. Organizations in Ontario (38.8%) and Quebec (21.9%) accounted for just over three-fifths of the country's total bus fleet. Urban municipalities owned more than 85% of all buses. Diesel buses were the leading bus type in Canada (65.9%), followed by bio-diesel (18.1%) and hybrid (9.4%) buses. Electric, natural gas and other buses collectively accounted for the remaining 6.6%. The vast majority (93.6%) of buses owned were reported to allow for accessibility. Over half (51.1%) of all buses were purchased from 2000 to 2009. Just over two-fifths (42.9%) of all buses were purchased after 2009. The remaining 6.0% were purchased prior to 2000. New Brunswick had the oldest bus fleet in Canada, with nearly one-third (29.9%) of their buses purchased before 2000. Less than one-fifth (16.8%) of the buses in New Brunswick were purchased after 2009. Conversely, 59.3% of buses in Newfoundland and Labrador were purchased after 2009. The majority (61.1%) of Prince Edward Island's 18 buses were purchased in 2016. Owners of the assets were asked to rate the overall physical condition of their public transit assets using the following condition rating scale: very poor, poor, fair, good and very good. See note to readers for a detailed description of each condition rating. Around two-thirds (66.4%) of all buses were reported to be in good or very good physical condition. 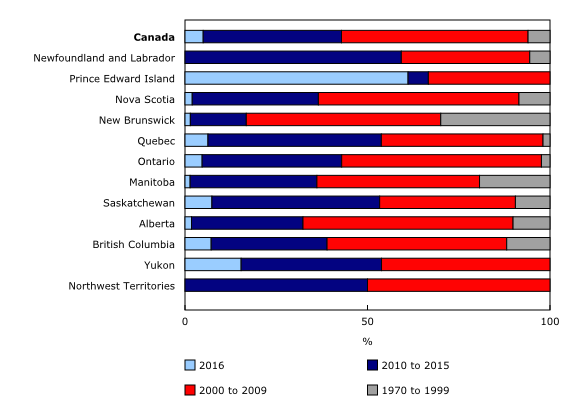 Governments in Newfoundland and Labrador (100.0%), Yukon (100.0%), the Northwest Territories (83.0%), Quebec (81.9%), Alberta (75.0%) and British Columbia (74.8%) reported the largest shares of their bus fleets in good or very good physical condition. Conversely, 6.0% of all buses in Canada were reported to be in poor or very poor physical condition. Manitoba (45.2%), Nova Scotia (39.5%) and New Brunswick (32.5%) reported the highest shares of their bus fleets to be in poor or very poor condition. The expected useful life of buses purchased in 2016 was 16 years for hybrid and bio-diesel buses, 14 years for natural gas buses, 13 years for diesel buses and 8 years for buses of other types. In 2016, all of Canada's 247 streetcars were owned by the City of Toronto. The vast majority (87.9%) of these streetcars were purchased from 1970 to 1999, while 12.1% were purchased in 2016. Reflecting the age of the streetcars, 88.0% were reported to be in very poor condition, while 12.0% were reported to be in good condition. The average expected useful life of streetcars purchased in 2016 was 30 years. Meanwhile, 12% of streetcars were reported to allow for accessibility. There were 3,479 railcars in Canada in 2016, all of which were owned by governments in Ontario (1,719), Quebec (1,131), British Columbia (336) and Alberta (293). Among all railcars, 2,056 were heavy, 1,124 were commuter and 299 were light railcars. The majority of heavy railcars (85.5%) and light railcars (100.0%) were reported to allow for accessibility. Nationally, 38.3% of commuter railcars were reported to allow for accessibility (10.0% in Ontario and 100.0% in Quebec and British Columbia). Over half (57.2%) of all railcars were purchased after 1999, while the remainder were purchased from 1970 to 1999. Over three-fifths (61.0%) of all railcars were reported to be in good or very good condition, led by Ontario (75.0%) and British Columbia (72.8%). Conversely, 12.9% of all railcars were reported to be in poor or very poor condition. Alberta (39.0%) and Quebec (26.4%) reported larger shares of their railcar fleet in poor or very poor physical condition. The average expected useful life of heavy railcars purchased in 2016 was 43 years, while the average expected useful life of commuter railcars purchased in 2016 was 30 years. Governments in eight provinces and Yukon owned 1,281 specialized transit for persons with disabilities in 2016, while governments in Newfoundland and Labrador, Prince Edward Island, the Northwest Territories and Nunavut owned none. The majority (85.3%) of specialized transit were purchased after 2009. Almost two-thirds (63.2%) of specialized transit were reported to be in good or very good physical condition in 2016, led by Quebec (91.8%). Specialized transit purchased in 2016 was reported to have an average expected useful life of nine years. There were 28,140 transit shelters and 740 passenger stations and terminals in 2016. The vast majority of passenger stations and terminals (96.6%) and transit shelters (91.8%) were owned by government organizations in Ontario, Quebec, Alberta and British Columbia. Slightly over three-quarters (75.3%) of transit shelters and less than half (43.0%) of passenger stations and terminals were built after 1999. Over two-thirds (68.9%) of passenger stations and terminals were reported to be in good or very good condition, led by government organizations in Manitoba (100.0%), Alberta (88.1%) and British Columbia (86.9%). Nearly three-fifths (59.5%) of all transit shelters were reported to be in good or very good condition. Nearly four-fifths (79.3%) of passenger stations and terminals were reported to be accessible. The average expected useful life of newly constructed passenger stations and terminals was 41 years, and 18 years for transit shelters. There were 334 park and ride parking lots and 255 passenger drop-off facilities in Canada in 2016. Collectively, Ontario, Alberta and Quebec accounted for just over three-quarters (75.7%) of all park and ride parking lots and nearly all (94.9%) passenger drop-off facilities. A majority of both passenger drop-off facilities (62.3%) and park and ride parking lots (54.5%) were constructed after 1999. Over four-fifths of both park and ride parking lots (86.1%) and passenger drop-off facilities (82.3%) were reported to be in good or very good physical condition. Newly constructed park and ride parking lots had an average expected useful life of 33 years, while passenger drop-off facilities had an average expected useful life of 13 years. There were 7,103 single-track kilometres of roads dedicated to public transit and 1,573 single-track kilometres of rail tracks, comprising the public transit track and road network in 2016. Government organizations in Ontario (68.4%), Quebec (13.0%), Alberta (9.3%) and British Columbia (9.2%) collectively owned all kilometres of rail. Ontario (40.4%), British Columbia (29.4%) and Alberta (17.7%) accounted for over four-fifths of roads dedicated to public transit. Over two-thirds of both roads (72.4%) and rail tracks (70.9%) dedicated to public transit were built before 2000. Almost three-quarters (72.7%) of rail tracks and about half (45.2%) of roads dedicated to public transit were reported to be in good or very good physical condition. Newly constructed rail tracks had an average expected useful life of 50 years, while roads dedicated to public transit had an average expected useful life of 20 years. Nearly one-quarter (24.8%) of owners had an asset management plan for their public transit assets in 2016. Urban municipal owners were more likely (30.1%) than rural municipal owners (12.3%) to have such a plan. Among owners with an asset management plan, nearly three-quarters (73.1%) reported updating their plan every one to four years. Among those without such a plan, 33.8% intended to implement a plan within one to four years and 5.9% in five or more years. Canada's Core Public Infrastructure Survey 2016 was conducted in partnership with Infrastructure Canada. Rural municipalities with at least 1,000 residents. The survey results cover nine asset types (bridges and tunnels; culture, recreation and sports facilities; potable water; public transit; roads; public social and affordable housing; solid waste; stormwater; wastewater) as well as information on asset management practices, 13 geographic regions, five municipality sizes and urban/rural municipalities. Throughout this release, the term publicly-owned refers to an asset being owned or leased by the provincial, territorial, regional and municipal orders of government. Very poor: The asset is unfit for sustained service. Near or beyond expected service life, widespread signs of advanced deterioration, some assets may be unusable. Poor: Increasing potential of affecting service. The asset is approaching end of service life; condition below standard and a large portion of system exhibits significant deterioration. Fair: The asset requires attention. The assets show signs of deterioration and some elements exhibit deficiencies. Good: The asset is adequate. Acceptable, generally within mid stage of expected service life. Very good: Asset is fit for the future. Well maintained, good condition, new or recently rehabilitated. Rolling stock assets: buses; streetcars; ferries; heavy railcars (subway); commuter railcars (locomotives and passenger); light railcars; and specialized transit (para or handi transpo and dial a ride). Streetcars usually operate in the centre lanes of mixed traffic, but may operate in their own rights-of-way. Ferries (that form part of the public transit system): Includes ferries used for public transit service travel (i.e. as part of the transit system). These ferries operate along existing waterways, and require passenger facilities to dock and load/unload passenger traffic. Includes salt water, open water and river ferries. Excludes ferries that form part of highway system. Heavy rail (subways): Heavy rail (subways) usually operate in tunnels, but may also operate at grade. Includes rail or guided tire based heavy rail (subways). Commuter rail (locomotive and passenger): Commuter rail (locomotive and passenger) link regional centres with outlaying communities and may operate along some of the same corridors and track used by freight and inter-city passenger rail services. Light rail transit (LRT)/Advanced light rail transit (ALRT): LRT/ALRT usually operate above ground in their own rights-of-way, however, some systems are operated in tunnels and on elevated guideways. Specialized transit services are transit services for persons with disabilities. Fixed public transit assets: passenger stations/terminals, transit shelters, exclusive rights-of-way, parking lots (park and ride), bicycle racks and shelters, passenger drop off facilities ("kiss and ride"), maintenance and storage facilities (garage, railway shops and service facilities), transit exclusive bridges, tunnels, tracks, and roads. Exclusive rights-of-ways include roadways reserved at all times for transit use and/or other high occupancy vehicles only. Excludes transit exclusive lanes that are only transit exclusive during rush hour. Maintenance/storage facility: Maintenance/storage facilities provide support and upkeep of the transit vehicle fleet, including light and/or heavy maintenance of transit vehicles. This type of building is usually joined to a vehicle storage building or yard, which provides parking for transit vehicles during downtime. Park and ride parking lots: Park and ride parking lots provided parking spaces with direct connections to the transit system that allow commuters to leave their personal vehicle and transfer to transit. Accessibility: This means taking appropriate measures to ensure persons with disabilities have access, on an equal basis with others, to the physical environment, to transportation, and to other facilities and services open and provided to the public, both in urban and rural areas. An asset management plan defines how a group of assets is to be managed over a period of time. The asset management plan describes the characteristics and condition of infrastructure assets, the levels of service expected from them, planned actions to ensure the assets are providing the expected level of service, and financing strategies to implement the planned actions. For more information about why the survey was conducted and how it will inform infrastructure policy and program development and investment decisions, please contact Infrastructure Canada (toll-free: 1-877-250-7154 or 613-948-1148 or by email at infc.info.infc@canada.ca) or Infrastructure Canada Media Relations (toll-free: 1-877-250-7154 or 613-960-9251 or by email at infc.media.infc@canada.ca).